Flickers is a free timing-based 2D platformer game developed by Neat Snake. It started as a student project for DigiPen course GAM 250 and was released on 01 May 2013. It is available for download on the developers website. The Sigil appears on a tree in the background shortly into the game. There is no way to indicate levels in the game, but judging from the game files, the sigil is in forest, level number 4. 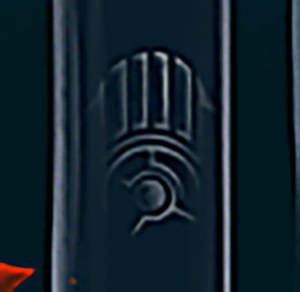 There is a circle on the sigil level that disappears after a very short time (about 3 seconds), and the piece appears the player reaches it in time. You cannot take the "normal" designed path of the level as it is too slow, and need to jump left from the checkpoint and then immediately make a a long jump diagonally up+right to the much further node. The piece was hacked initially by modifying the level data — moving the triggering point and hitting it in the game. This was prefaced by reversing the level format, writing tools to convert it back and forth into XML and noticing that a certain thing was only present in the sigil level. The legitimate solution — hitting the trigger where it is placed — was discovered shortly thereafter. After the piece was retrieved, the developer of the game joined the Discord server and chatted with the Detectives. The sigil is one of the textures on Forest6 sprite sheet. 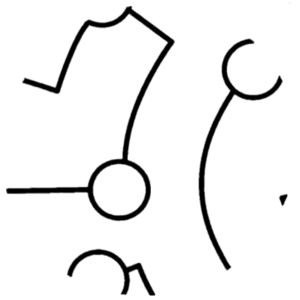 It is referred in Forest6.json as sigil.png It is used on the level described in forest_paul4.blvl. This page was last edited on 1 March 2017, at 21:54.